We were in our prefectural town of Alençon today and came across this. 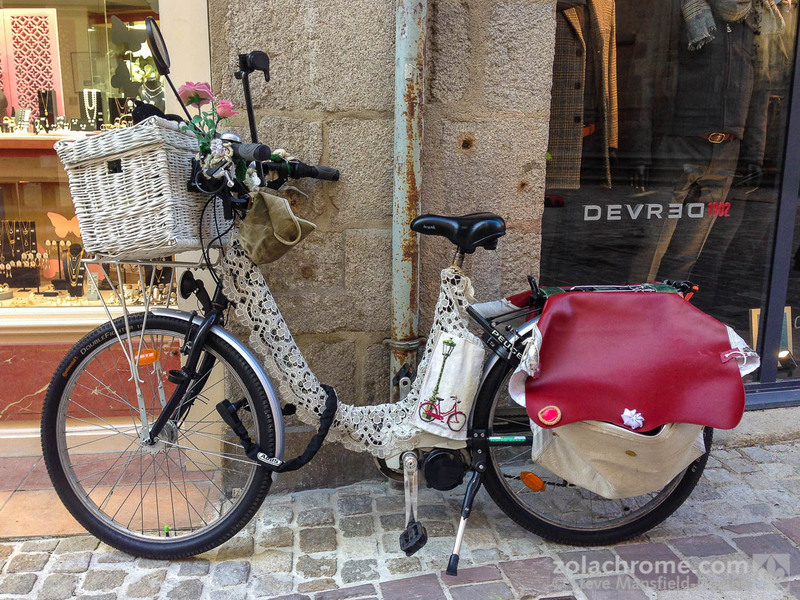 It’s a Peugeot e-bike, but fitted out with some style. And those are some serious panniers. The bike has a chain around it, but isn’t fixed to anything permanent. Nor, as far as I could see, are the panniers secured in any way. This makes me think that the Orne department of Normandy might not be a hotspot for bike theft. The knitted cat on the basket also makes we wonder if a real cat is a frequent passenger on this bike. There’s an effort in France to get more people cycling as part of their daily lives (not just as a sport – that already has the status of a religion here). The new campaign includes measures to cut bike thefts, although from what I can see the levels of theft are currently about two-thirds of those in the UK and, I suspect, mostly confined to larger towns and cities. In fact, we saw plenty of people cycling in town today on what might be classed as commuter rather than sport bikes, and wearing normal clothes, not logo-infested lycra. Very encouraging.